HOW TO-Tutorial with digital photo demo on pulling REALLY long clay handles. 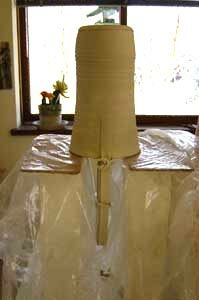 I revere, recycle, reuse and renew laguna B-mix white stoneware cone 10, for handle pulling clay. 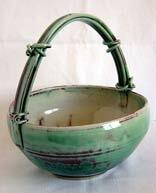 The clay and it's plasticity is the most important factor for the handles to maintain integrity through all steps: pulling, shaping, drying and attaching to pottery. The clay handle has to be pulled perfectly with no flaws in it's composition or delivery. Any problems will show up in the bisque and glaze high firings and the clay handles will not sustain their shape or integrity. 1st step: Pulling & setting clay handles up to 30" inches long. 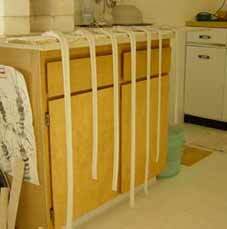 Let hang straight down, drying very slowly. Drying time depends on your local climate and environment. Allow no direct sun light or halogen lighting directed at the clay handles. 2nd step: Shaping & forming. Shaping the clay handle into the curve needed. Shape over a wood dowel rack in a very cool dark place. Important no artificial light used in room to cause uneven drying. 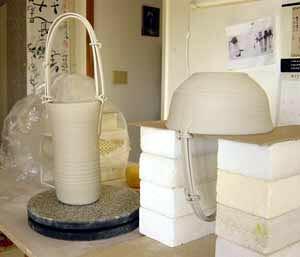 I test for clay doneness by touch and feel, ready if clay can hold shape, so to handle, score and attach to pot. 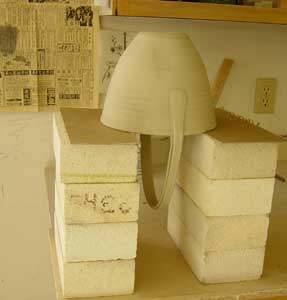 3rd step: Attaching & scoring Attaching clay handles to vessel. I build stands quite high so I can work on inside and pass the long (30"in.) handles through to other side of vessel. I am working upside down and takes quite a yoga move to sustain this posture. I find a very limited window in working time for this step. 4th step: finish and clean up. Cover with plastic to dry for many days, upside down. 5th step: Flip pot over after a few days drying, for detail and finish work. Then flip upside down again, to continue the slow even drying process. Glazed high fire cone 10 gas reduction.